Let’s talk about a little thing called Homestuck. You’ve heard of it, maybe? If not, a little background: Homestuck is the fourth and longest chapter of an online comic series titled MS Paint Adventures. Homestuck began as a riff on adventure games, starring a basic character in an adventure game world… but slowly morphed into an internet epic, spawning its own fanworks, full animations, music albums, cosplay, and more. Among the “more” was an extremely successful Kickstarter, to bring everything full circle and fund an adventure game based on this comic based on adventure games. The Kickstarter for the game gathered almost 2.5 million dollars, just one example of how extremely motivated the Homestuck fandom is. At GDC, I got a chance to talk to Jess Haskins from What Pumpkin Studios, the game development team that is working on the Homestuck Adventure Game project. Later I followed up with her on Skype to ask some questions about the New York-based What Pumpkin, and what we can expect from this game, called Hiveswap. Hiveswap is a game about Homestuck, but more importantly, it’s a game about games. 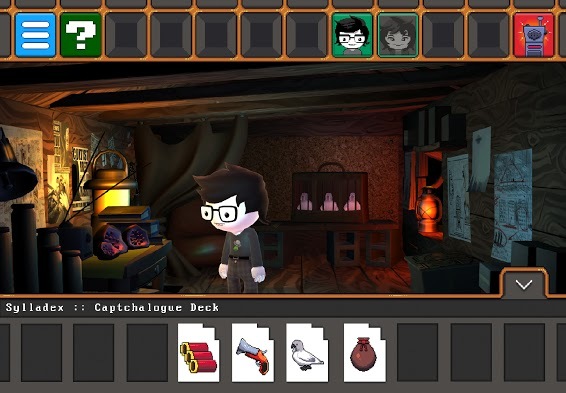 The humor in this adventure game centers on adventure game traditions, lampshading them and showing them off, focusing on, as Haskins put it, “how challenging and arbitrary video game systems are.” How does life work in a world where “your inventory” is a tangible reality for people, not just a game abstraction? What if the game’s narrator, or even its hint system, was a character with his own agenda? Already, with this proposal, Hiveswap has a few tightrope walks to pull off. There is a challenge to make the humor work, timing jokes and commentary with gameplay. And there is also the critical challenge of how to distill the complicated world of Homestuck into something accessible for newcomers. What Pumpkin is working on creating a game that will be fun for fans, with all the Easter Eggs they’ve come to expect, but will still be a point of entry for people who aren’t already fans of Homestuck itself. Because of this they’re working on a brand new story, set in 1994. The internet was new then, and adventure games were pretty hot. 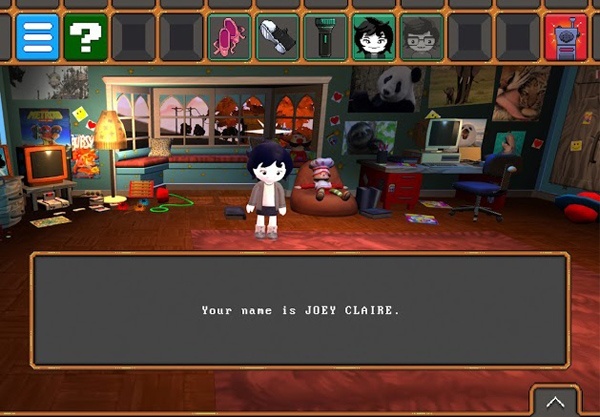 The game stars a “90s Girl” named Joey Claire, with other playable characters in the form of her brother Jude Harley, and a Troll named Xefros Tritoh. The adventure begins when Joey is sucked into the Troll world of Alternia. Starting with fresh characters in the world means that players will have a new introduction to the setting. Since the story of Hiveswap is set before the Homestuck comic begins, it doesn’t have to worry about bearing the weight of the comic’s history. Haskins compared it to the Sam & Max adventure game series – if a player has familiarity with the Sam & Max comic, they’ll get something more out of the adventure game series, but knowing the comic isn’t necessary to find the game series fun. Also like the Sam & Max game series, Hiveswap will be episodic, with plans for four acts total. Right now the team is entirely focused on developing Act One, to be released simultaneously for PC, Mac, and Linux. Act One is shooting for a Mid-2015 release date, with the other acts to follow. What Pumpkin Studios is working out of a New-York-based co-working space. Twelve people are working full-time on the game out of the New York studio, but that’s only the beginning. Quoting Homestuck creator Andrew Hussie, Haskins said, “At any given time, there’s between 30 and 1000 people working on Hiveswap.” The game has a need for a lot of art assets, and music, and the development team realized right away that Homestuck’s fanbase was a great place to find creative people to contribute to the project. Anyone working on the game is being compensated for their time, depending on how much they’ve contributed. Composers working on the game are James Roach and Toby Fox, who also created some of the music for previous Homestuck inspired albums. The art style of the game will be 3D, which is a bit of a departure from the 2D world of the comic. But the look of the comic dictated the look of the game a lot, with bold colors and character designs. “We have a very engaged and creative community,” says Haskins, and the Hiveswap developers wanted to capture this and reward this enthusiasm in the game. Andrew Hussie is, according to Haskins, highly involved in storytelling for the project and creating high level vision. Drafts are sent to him, and it’s “very collaborative,” but the project isn’t micromanaged by the creator either. Experienced game developers on the What Pumpkin team have a lot of input. Haskins also mentioned Ryan North, of Dinosaur Comics fame, as an early collaborator on the game’s high level story. Haskins herself was brought on to the Hiveswap project as a game designer after the Kickstarter ended along with the New York based studio. Haskins has worked on a variety of games, from puzzle platformers and social games to the multi-player shooter Guns of Icarus Online. As Hiveswap is ultimately a game about games, the different inspirations for the game are many. Haskins cited the Ultima series, Myst series, and Quest for Glory series as her own favorite inspirations, along with the classic comedy adventure games such as Grim Fandango and Full Throttle. The story of Hiveswap has a lot of complexity: it forks, and will encourage replayability with its web of different choices. 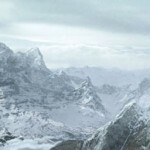 The player can establish connections with characters: use that to open up the story in different directions, or just chatter with your virtual friends (and enemies, and frenemies) on the in-game “Troll social media network,” Prongle. For more information about Hiveswap, you can check out the public posts on the Kickstarter page, and the official site, Hiveswap.com, where you can sign up for the email distribution list. Thanks to Jess Haskins and What Pumpkin for this peek at the game! bloodyAristocrat began troling: OMG I can’t wait! Is there any way to pre-order? weabooSlayer started pestering: I kan’t Wait for this game, its so kewl looking!